Avec le soutien de la fondation Louis Roederer, de la Howard Greenberg Gallery, New York, et de la galerie Polka, Paris. The American colour photography master Joel Meyerowitz began his career in New York in the 60s. As a street photographer, always out and about in the heart of his city, Meyerowitz slips and dodges through the urban fray, his eyes ever on the alert. His complex compositions toy with the notions of imbalance and deframing, and seem suspended as if by a thread. 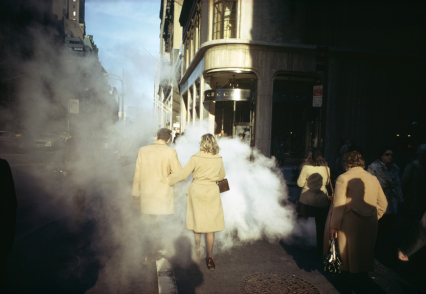 For the first time in France, the Rencontres d’Arles will exhibit forty original prints by Joel Meyerowitz, with a selection of his first photographs in black and white and in colour.